Broken engagements are painful for both parties, but in addition to the emotional distress, there are legal issues to consider. The former couple must decide who gets to keep the ring. In Indiana, this question is fairly simple, established as law in 2005 by the case of Fowler v. Perry. Regardless of who breaks off the engagement or for what reasons, Indiana law recognizes the owner of the ring as the purchaser in the case of a broken engagement. Engagement rings are considered conditional gifts under Indiana law. A conditional gift is one given with a set of requirements to be fulfilled in order for the property to transfer, legally, to the giftee. In the appeal opinion written by the Honorable Bernard L. Pylitt , he states that "a gift is conditional if it is conditioned upon the performance of some act by the donee or the occurrence of an event in the future." In the case of engagement rings, the ring is given as a token of a contract to marry. 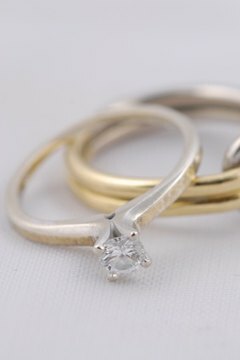 Should the marriage not take place, the ring (or the value of the ring) must be returned to the party who purchased it. An exception to this judgment is if the engagement ring can be construed to not be a conditional gift. An absolute gift (known as an inter vivos gift in legal terms) is one in which the gift is given with no strings attached. Rings presented on birthdays or holidays, such as Christmas and Valentine's Day, may be seen in a court of law as being absolute gifts, rather than contractual gifts. Under Indiana law, an engagement ring never becomes the woman's sole possession; rather, it is a conditional gift until marriage, and a joint asset after marriage. In the case of a divorce, the ring will be treated like any other communal property. Indiana Business Journal: With this ring ... Engagement jewelry becomes divisive part of dissolutions, breakups. Meyer, Christine. "Indiana Laws on Engagement Rings." , https://legalbeagle.com/6677582-indiana-laws-engagement-rings.html. Accessed 22 April 2019.